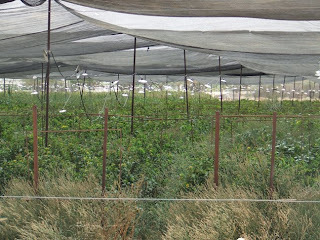 and I may have also posted about the lightbulb greenhouses in the Jordan Valley. 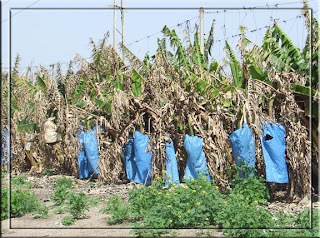 Today I bring you the bag plantations of the Jordan Valley. Shown here are both the plastic and paper bag varieties. So why are the bunches of bananas wrapped in bags? Well, bananas produce ethylene gas to ripen. By wrapping the bunches in bags, it contains the gas and the bananas ripen quicker. Pesky, please bring your camera to the Tel and we'll f2f.